In transgressive sequence systems tracts, sedimentation rate and sediment influx exceeds sea level rise resulting in sediments being deposited closer to shore along margins, on the platform and farther up slope, so reducing the sediment available. 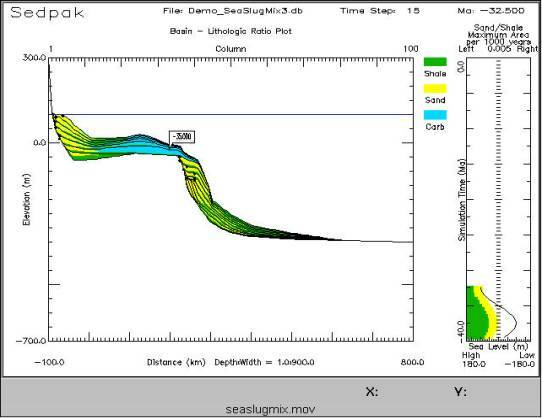 The start-up phase in which carbonate accumulation is less than relative sea level and deposition on the shelf resumes being deposited closer to shore, followed by catch-up when sediment rate of accumulation exceeds rate of sea level rise, resulting in a prograding shift of sediments down slope. The transgressive systems tract peaks with the carbonate accumulation keep-up closely matching the rate of rise sea level. (Handford and Loucks,1993). The figure below was taken from a quick time movie and represents a cross-section of a transgressive sequence of a normal carbonate cycle. The transgressive sequence is denoted by the sequence of sediments ranging from 40 to 32.0 my on the bar scale adjacent to the picture. Click on image below to see a quick time movie of the response explained above.